I picked up a new toy for my bike this past week. My Dawes bike hasn’t had a bell on it, probably since I bought the bike. It came with one, but it’s pretty poor bell that the bike came with (something cheap and nasty that the bike has to be sold with in the UK). It just about works. Nothing special. Anyhow, I’ve been using the bike for a while now but I’ve not had a bell on it and this can get annoying - riding to work, the majority of the route is along a shared path and it means that I can’t warn people that I’m coming up behind them. So I decided that I needed to get a new bell and so I had a look around. 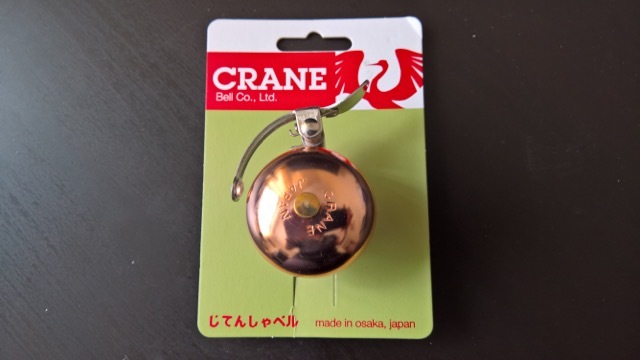 I eventually settled on a Crane Sakura bell. I’d considered getting the one of the Lion Works bells but it seemed that they might be a little large for what I was thinking and the alternative one I was looking at, the Spurcycle bell was just a bit to pricey. 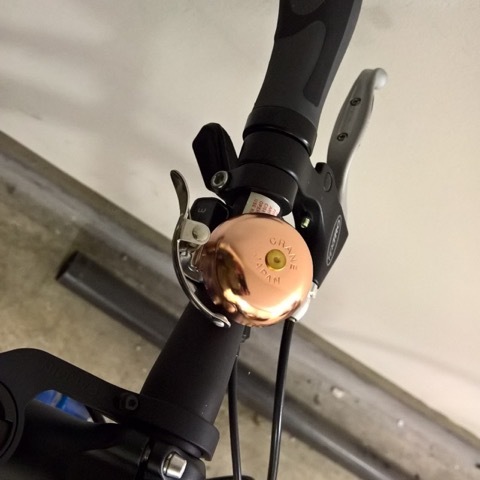 I decided that the brass Crane bell would do the job and I ordered from Velo Vitality. It wasn’t a shop I’d ordered from in the past, but I was very impressed with the service. The bell was sent on the same day I ordered and was shipped via Second Class Recorded (which did mean a few days delay whilst I had to go to the post office to get it but rather this than go to a courier location!) I’d happily recommend them again and I’ll keep an eye on their website (they’re based in Brighton with a store just near the station apparently). Anyhow, I fitted it this weekend to Odin finally. I had no trouble installing it, even though the standard bars that Dawes installed on the bike have quite a slope. Ideally, I’ll get an old inner tube and create an inner for the attachment because at the minute, the bell is metal against metal which isn’t ideal but does work. All I need to do now is to get out on the bike again!